It was the final day and after about 5 hours of descent through the hills on the road, we had stopped for lunch about 100km from Haridwar. Of the 14 people who stayed until the last day, 5 of us were in a Sumo and 9 were in a Tempo Traveller van. We had already said our goodbyes when we got into the vehicles, but we happened to stop at the same place for lunch – thanks to the drivers. Daksh, a 10 year old who breezed through his first trek, came running to us from the van and hugged Arvind who had just finished his second back to back trek and has plans for 2 more next month. Both of them were beaming happiness. This pretty much sums up the past 5 days in the trek! The rest of the trip was just descending further and getting into civilization, reminiscing all the fun, catching up with civilization and slipping back into the bustle and the noise of normal life, with more goodbyes. starts as soon as possible, but isn’t too long – I had to be back in Bangalore in a week. had opportunities to enjoy – great views of the snow capped mountains and the night sky. not too hard – I didn’t want to spend all my time thinking about where and how I was going to put my next step. I wanted a relaxed trek with time to look around and take in the beauty. There were only a couple of treks that seemed to fit the bill. baali pushed me and got me registered for the Deoriatal-Chandrashila trek. 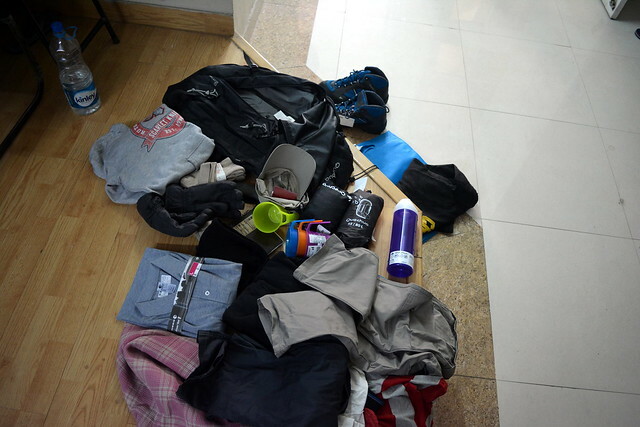 I got my “trek uniform” from Decathlon and packed my bags for the trek – I only had a couple of days to do this. I was sorta nervous about all this because I really dislike cold weather, but baali gave me loads of moral support to take the first steps. This post is an attempt to record this trek for my future self. If you’d like detailed documentation for the trek, see India Hikes’ documentation. I reached Haridwar in a bus from Delhi, way before the scheduled time to meet everyone else. 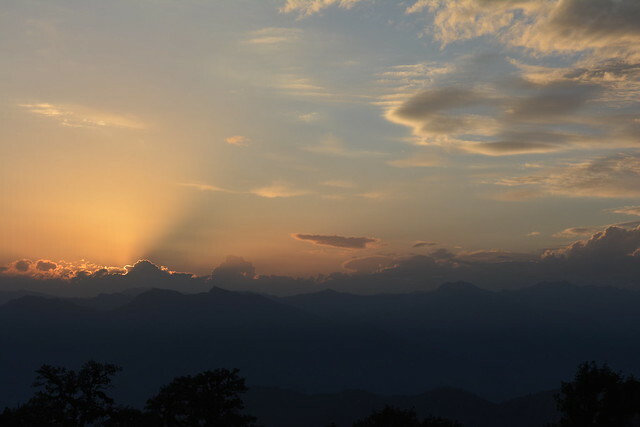 I walked around the town before sunrise, reached the station and waited for trekkers to start trickling in. The base camp, Sari, was about an 8 hour ride from Haridwar, that I spent mostly sleeping – it was quite hot! Much hotter than I expected. And I started to feel comfortable about possibly not having enough clothing for the cold. When packing, baali and I were trying to make a sensible trade-off between the amount of stuff I carried and not feeling uncomfortably cold. He had the experience of one-trek and was leaning towards the lighter-backpack side, and this being my first trek I wanted to be heavily on the extra-clothing-for-cold side. The final state of my backpack left behind a slight worry in the back of my mind, which kept coming to the fore from time to time, until the bus ride. 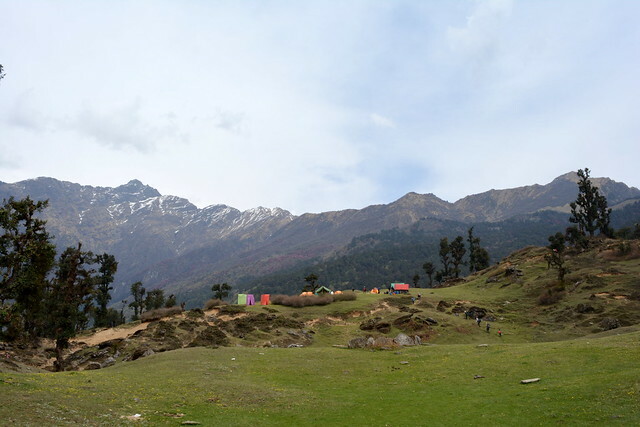 The base camp turned out to be a small lodge sort of a thing with cozy rooms for the trekkers and India Hikes trek leads, guides and other support staff. The views from here weren’t very different than what I could see from Mukteshwar. 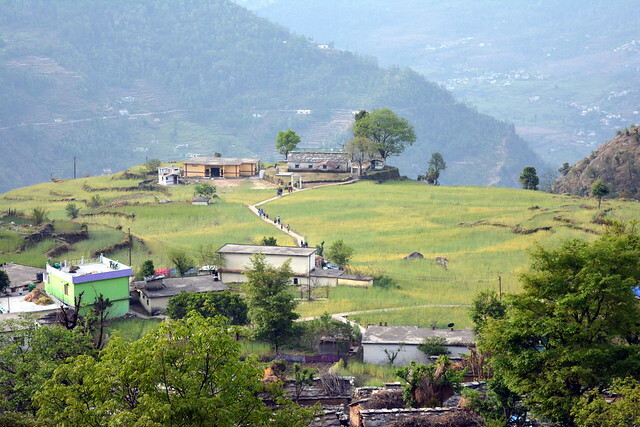 There weren’t really any snow peaks in our view and there was a lot of lush green and the Sari village in view. We were received by similing faces of the support staff and trek leads, welcoming us on the trek. The comforting camaraderie would be a feature throughout the rest of the trek! Our group had some people who had done treks with India Hikes before, and all the interactions around me were giving me a good feeling of joining a great community. Everyone other than me seemed to know everyone else, yet new people were made to feel comfortable and I felt totally at home. 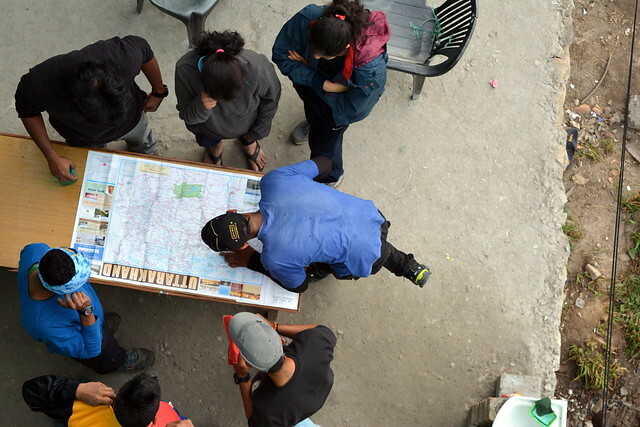 Kamal, our trek lead, briefed us about the trek and wished us good luck for the trek. The thing I loved the most about the briefing was our guide Dhan Singh explaining to us that India Hikes aims to make high altitude trekking more generally accessible and that we should treat this trek as a learning experience to be able to go on treks by ourselves with friends and/or family! It was going to be 4 days of learning about all sorts of things from symptoms of AMS and the horrors of it to using micro spikes and different walking styles on snow & ice! 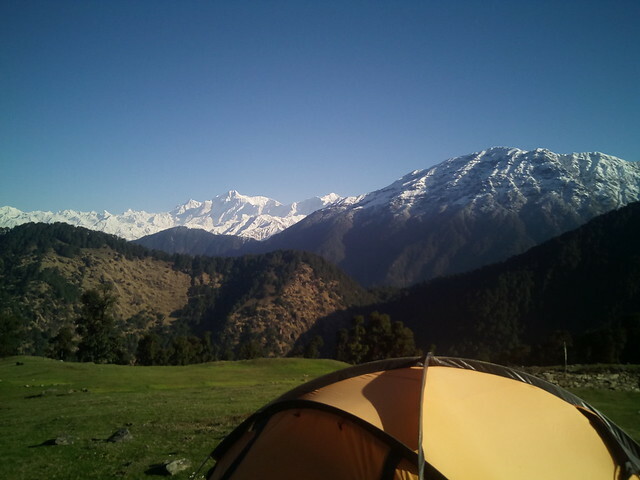 It was also the beginning of 4 days of listening to so many stories of various different treks, especially Roopkund. 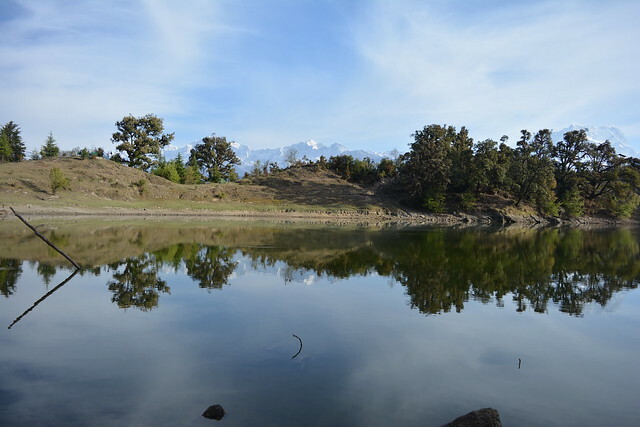 After some lovely breakfast, we packed and set out for what was going to be a short hike up, to Deoria tal – lake created by the Gods. 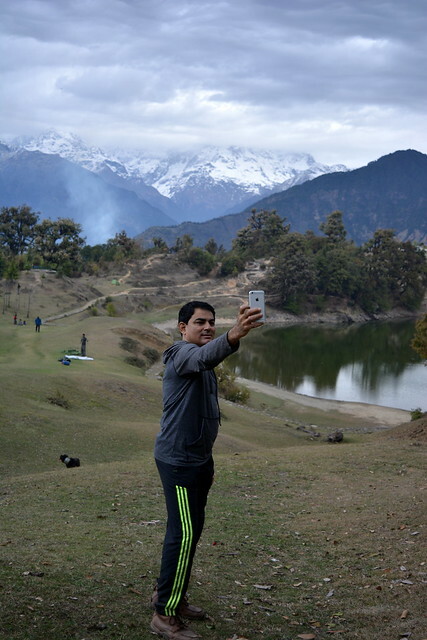 Beautiful meadows, a lake and glorious views of the snow-capped mountains in the backdrop. Picture perfect! This was exactly the kind of thing I was looking for, I thought, when I ended up at Mukteshwar! This was just what I wanted from the trek. Apart from the gorgeous night skies. This was the best part of the trek, for me. Even more than the summit. The rest of the day was spent walking around the camp-site, and taking in as much of the beauty as we could. We walked up to a couple of view points that gave better views of the mountains and walked around the lake, enjoying the calmness. We could see Chandrashila, the peak we were going to summit in 3 days from the second view point. Also, the Rhododendron covered slopes were a sight to watch! Playing Frisbee with the trekkers and cricket with cooks and other support staff taking care of people at the camp, along with the trek lead and guides added more physical activity that I enjoyed quite a bit. The sport, apart from getting to hang around with people and getting to know them, also helped me keep myself warm, through out the day, without too much clothing. The camp site had a few other camps, some of whom we interacted with and others who we didn’t talk to but were spotted near all of the rest of the camps we were going to have in the next 3 days. We had some story telling, singing and oxy-meter readings in the dining tent before yet another yummy meal. My oxygen levels were good, but my pulse was close to 90. It had come back down to 60 during the next couple of days. I wonder if my body was still acclimatising or if it was signs of some of the anxiousness that was going to hit me later in the night. I went back to sleep after fooling around with the other post dinner, till about 10 o’ clock. I fell asleep quickly, but I started feeling extremely anxious and uneasy, to the point of me even thinking of hiking back down to the base camp. I’m still not sure what it was that made me so uneasy, and thankfully I didn’t have the feeling again during the rest of the trek. I was able to ease back into sleep with some reading. 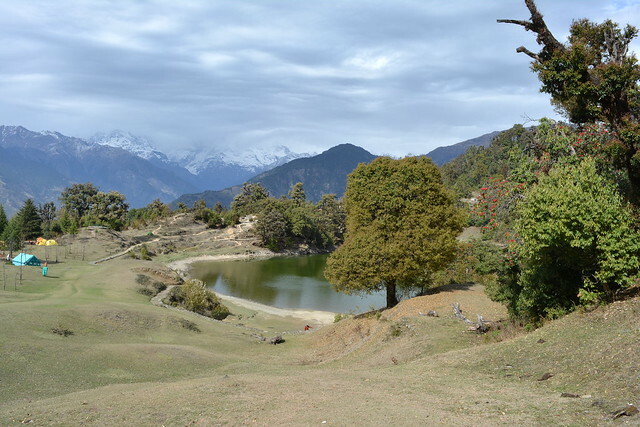 I would definitely think of Deoria Tal, whenever I felt the need for a calm amidst some awe-inspiring beauty, without trekking too much. We woke up to a clear sky and a serene lake that drew me to go and sit by its side, until breakfast. We got packed up and prepared for what was going to be the longest day, in terms of the time spent hiking and distance covered. The hike was going to be through a forest trail, with lots of Rhododendron trees and dozens of different bird species. This stretch of the trek also had some of the views I liked the most. The hike was relaxed and we had our packed lunches after about half way through the trek. The lunch, like all other meals, was so yummy that I regretted carrying such a small box. Ankit, Abhirut and Shyamlee with bigger boxes, kindly shared some of their food with me. Near the end of the hike we bumped into Tanmoy – another Trek lead with India hikes who was going to meet us at our next night’s base camp. 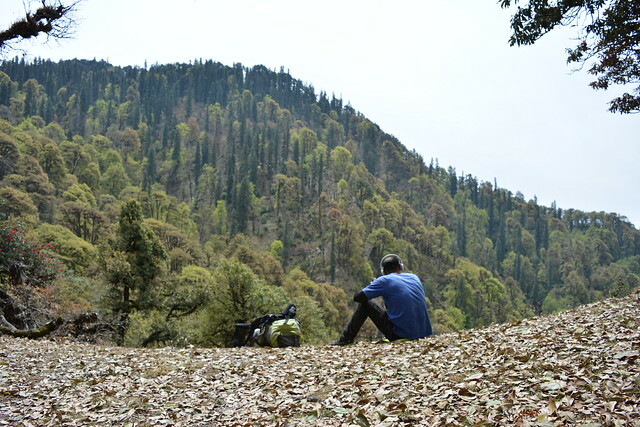 He was mapping the trek route and had covered our 3 day trail in a single day. The next night at Martoli he would tell us his story of how he got into trekking and inspire us with them! The evening was a musical one. After our daily dose of Himalayan stories, it was great to hear trek lead Kamal, sing some popular numbers with so much feeling. Pooja and Meenakshi followed up with a deluge of songs before and during a fun filled Antakshari session. Sai, Padmini and Sarita sang some old numbers, some of which seemed like “home-productions” to the opposite team. We woke up to some rain and cloudy weather. We delayed the start a little bit, to make the trek more comfortable, since it was going to be a short trek anyway. The skies cleared up pretty quickly and we hiked up to Martoli through a maze of Rhododendron trees! Bhrujgali was supposed to be our next camp-site but we camped a little lower, at Martoli, because it had a more accessible water source. We did the same at Rohini Bugyal, the previous day, camping at Tala instead of the usual spot. The hike was a pretty simple one, that took about 4 hours. 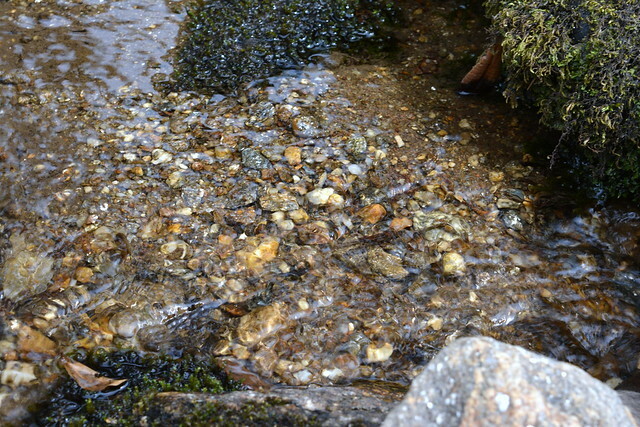 We stopped at a refreshing stream on the way, where we had our lunch and took lots of photos! The trail was a forest trail that seemed very similar to some of the trails through the Sahyadris. One of the trekkers, Padmini, took a different trail at a fork and we had a few anxious moments, looking around, for her. She had some very anxious moments, but was really happy that she was brought back safely to the group by Dhan Singh. It may be useful for the trekkers to carry a whistle to make it easier to seek attention in such cases, Sai mentioned. I spent some time during the rest of the hike walking with Padmini, chatting up and getting know things about each others’ lives. I decided not to click any photographs and look around more. Also, not having much power in the battery helped enforce this decision. Batteries drain pretty quickly in such cold weather, and I learnt that keeping the batteries in your sleeping bag can help prevent that. I wonder why people don’t carry some kind of solar chargers, instead of carrying so many spare batteries and power banks. Also, it may be interesting to look for devices that convert some of the energy spent hiking into usable power. The evening was spent relaxing, talking and getting to hear more stories! We also had the company of the group who had gone to the summit on that day, and were trying to help us with some tips from their newly gained experience! We were taught how to use clamp-ons, micro spikes and gaiters, in case there is snow or ice on the trail. It was going to be a 4am start the next day, and almost everyone hit the sacks immediately after an early dinner. 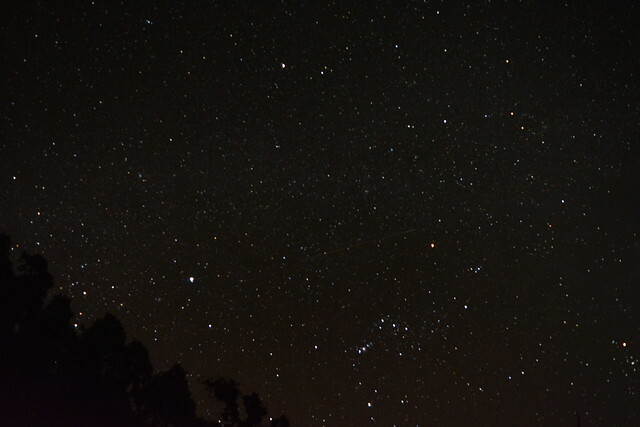 Rajesh and I, though, were struck by the beauty of the night sky. I tried my hand at some night sky photography and got some okay-ish shots, including one which captured a shooting star. A wide angle lens and a tripod would’ve been extremely useful. Activity started in the camp-site from as early as 2:30 am. Excitement was in the air. Trek leads and guides were pushing hard to get people lined up as early as possible, to avoid hiccups due to melting ice and snow in the trek. We managed to get the whole group going by 4:15 am. It was going to be one of our steepest climbs of the trek, to Bhrujgali, in the darkness. Owing to the darkness, the two guides and the trek lead had to be helping people out, more than usual. I ended up being the sweeper until it was dawn, with some company from Abhirut, Ankit and Shyamlee. It was fun just screaming out to push people, mentally. Much like cheering from the sidelines during a game of Ultimate. It was inspiring to see people pushing themselves hard, despite their physical problems. Asthma, cramps, come what may, lets get to the top! I hiked up with Padmini, who was probably the eldest trekker and was slowly but steadily making her way up. It always helps to have someone talking to you, to distract you from your lizard brain. She was quite happy that I walked with her all the way up. The bird watchers amongst us, were delighted by how many Monals they spotted. The view from the top was gorgeous. Many many dozens of photographs were taken, in various poses, and various directions. It all looked so glorious that nobody really wanted to stop. So many snow covered peaks, all around. Raju bhai, Dhanno bhai and Kamal bhai had a lot of work to do, telling all of us the names of the different peaks that we could see. But, not before the excitedly told the rest of the India Hikers that everyone in the group had summit-ed. They were very pleased by the fact that the whole group made it safely to the top! On some of the previous nights, I saw some folks use apps on their phones to help them identify stars and constellations in the night sky. Nobody seemed to have an app that helped identify the peaks. It would be interesting to find or build something that does this. The descent was much simpler and quite relaxed. 5 of the trekkers left early, because they wanted to get to Haridwar for some more adventure and fun – rafting and more bird/animal watching. The weather suddenly turned bad. It got super cloudy and the wind got really chilly, before there was hail and snow. Everyone got into their tents for the afternoon, and this was practically the first afternoon I spent inside the tent. Once we got out of the tents after a couple of hours, the landscape had totally changed. Everything above about 50m from where we were was filled with snow, and we experienced the coldest and harshest weather of the trek. It was the first time, I felt I had got the balance of how much cold clothing I should be carrying wrong. I had used up all the layers of clothing I had, and yet felt a chill when I was not inside a tent. Next time around I’ll definitely erring on the side of carrying more. The weather didn’t get any better until the next morning. We spent the evening in the dining tent, chatting away and playing Uno – led by Mitali, a 10 year old who also breezed through the trek along with Dhruv who was also 10. We stuck together the whole evening to keep ourselves warm, and the trek was officially called to an end with certificate distribution and everyone sharing some of their thoughts about the trek. I got back to Delhi with the others, from Haridwar and then to Bangalore. Its nice to be back amongst friends and family and back in familiar places. But, the silence of the mountains does haunt you for a while. If I do go back up the mountains through a trekking group, you know who I’m going to be going with! 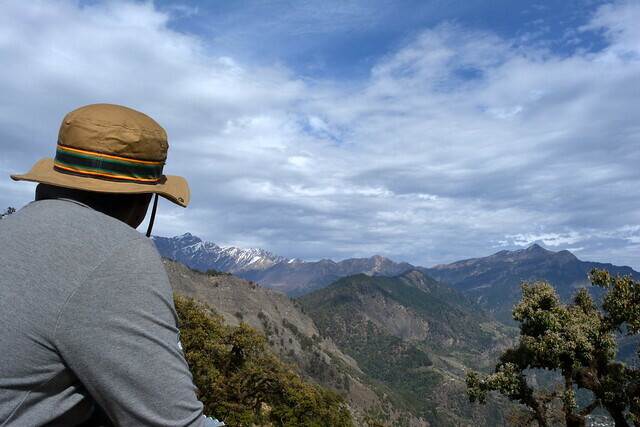 India Hikes did manage to give me that feeling of being a part of wonderful community that is trying to make High Altitude trekking more accessible by documenting various treks and arranging treks with excellent support including some very delicious food. I’ve always liked the idea of “leaving a place better than you found it”. India Hikes seems to really believe in this idea, and is trying really hard to encourage trekkers to imbibe this value and help each other in this mission. I really hope that there’s at least a handful of people in each trek, who take back this idea along with pleasant memories from the mountains. On the whole the trek was an amazing experience. Gach yaara! 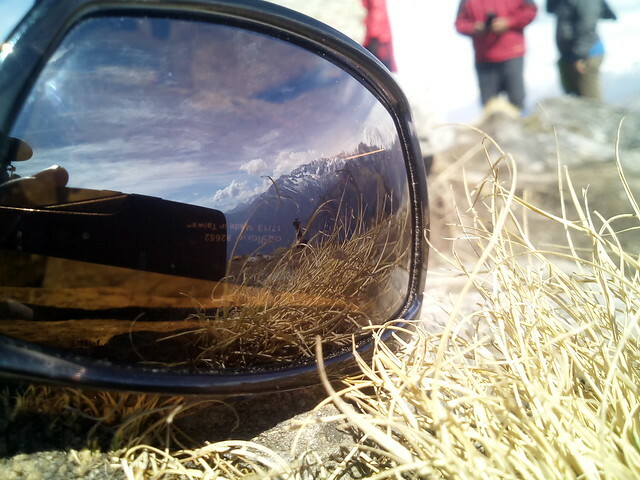 I am definitely looking forward to go on more treks. As much as I dislike harshly cold weather, the beauty of the mountains is just too irresistible. You can view more pictures of the trek here.